A backflow prevention device is a mechanical device with check valves, air inlets, and/or relief valves installed on water piping. Its primary function is to prevent contaminants from entering the public drinking water supply when either a backpressure or backsiphonage event occurs. The local water purveyor in your area and/or the Health Department will decide where and when a backflow prevention device is required. 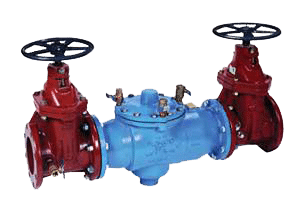 Backflow preventers are mechanical devices, and as such, are subject to failure due to continuous use, foreign objects, and deterioration. It is impossible to know if it is working properly by appearance alone. By law, backflow prevention devices are required to be tested at least annually by a certified tester with proper test equipment to verify they are working properly. If during testing the device fails the minimum test requirements, it is considered a health hazard, and must be repaired within a reasonable amount of time, usually determined by the water purveyor. Backflow testing is essential to maintaining a clean water supply. If your backflow system isn’t tested, there is potential for cross connection contamination and pollution of the water supply due to the water reversing directions and flowing backward. Our backflow testers have completed a 40 hour Certification Training Course. In addition, they must attend supplemental training at periodic intervals to maintain their certification. They are thoroughly knowledgeable and capable of testing any backflow device. Upon completion of annual testing of the backflow preventer, we will provide the completed test report ASAP to the local water authority. Should your backflow fail the annual testing, we will contact you with pricing to repair and retest the device in order to ensure that the device works as designed to help maintain a clean water supply.